Gadhafi Ruled Libya With An Iron Fist Moammar Gadhafi was a young army officer when he first seized power in a September 1969 coup. During his rule of more than four decades, he was an unpredictable, often brutal leader with an inflated vision of himself. On Thursday, Libyan officials announced that he had been captured and killed. 1969: Col. Moammar Gadhafi (right), two years before he seized power in a coup. He and a group of revolutionary army officers ended the 18-year reign of King Idris. 1977: Gadhafi bonds with Palestinian leaders Yasser Arafat (right) and George Habash at an Arab Nations Summit in Tripoli. In the 1970s, Gadhafi pushed for uniting all Arab states into one and published his political manifesto, The Green Book. 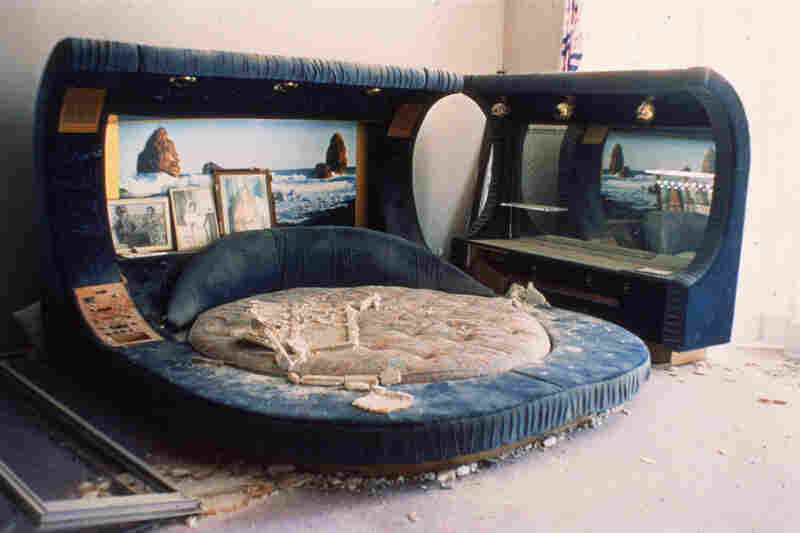 1986: A bed in Gaghafi's Tripoli home after U.S. planes bombed Libya's capital. 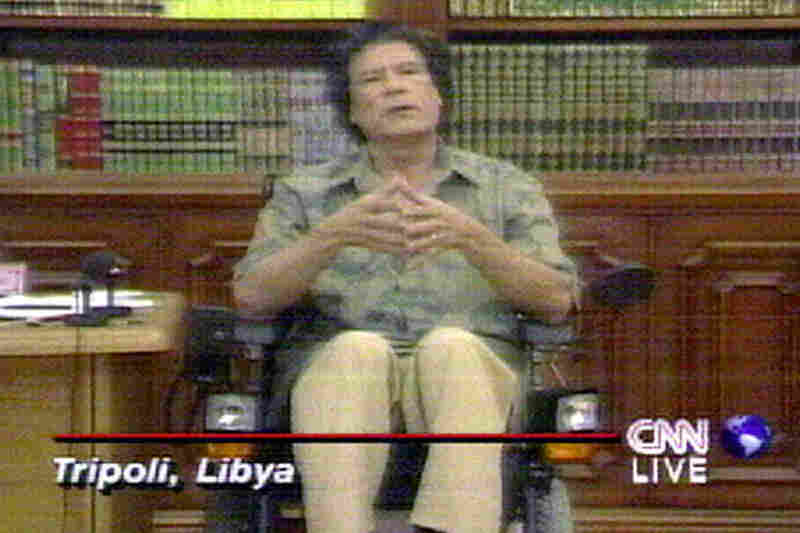 Gadhafi was not injured, but 100 people reportedly died. The U.S. said it was retaliating for the bombing of a Berlin nightclub that killed two American servicemen and a Turkish woman. 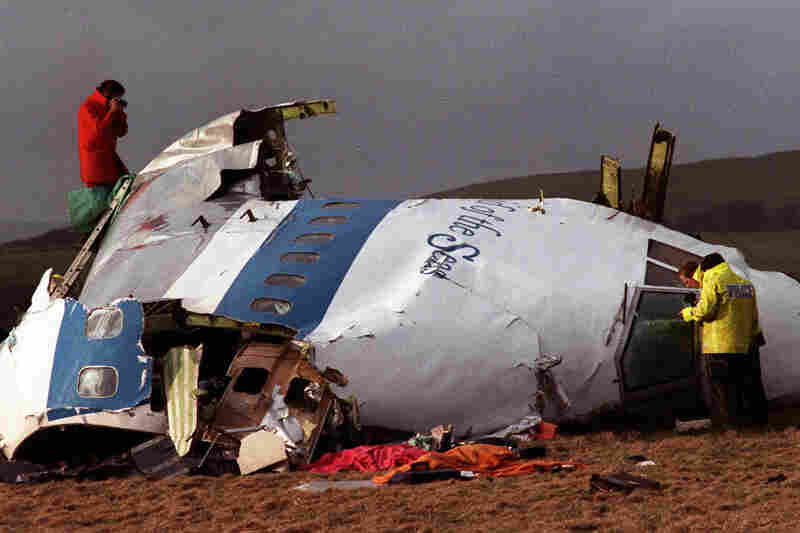 1988: Investigators sift through the wreckage of Pan Am Flight 103, which exploded midair over Lockerbie, Scotland. The 270 dead included everyone on the plane and 11 on the ground. Libya did not officially take responsibility for the bombing until 2003. 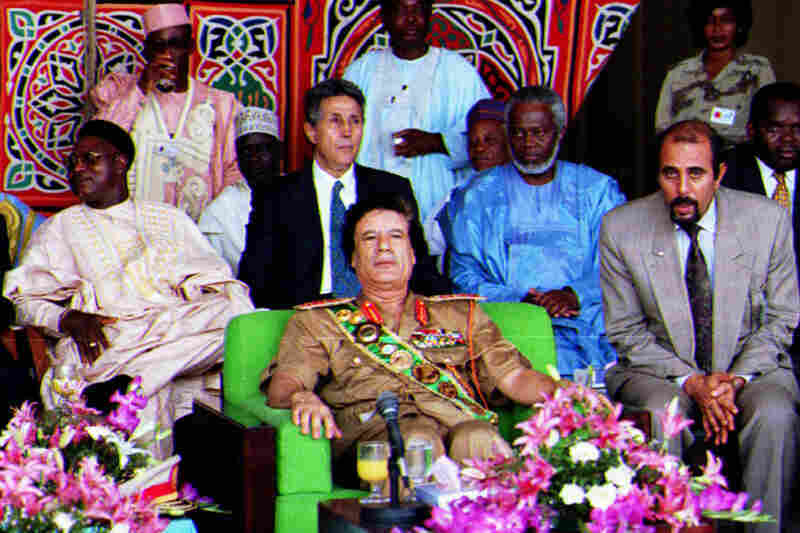 1996: Surrounded by guests and aides in Tripoli, Gadhafi marks the anniversary of the 1969 coup that brought him to power. 1998: Gadhafi speaks at a press conference about the potential handover of two Libyan suspects in the 1988 bombing of Pan Am Flight 103. The men were turned over the following year; one was convicted. 2004: Gadhafi visits the European Union in Brussels — his first official trip outside Africa or the Middle East since 1989. 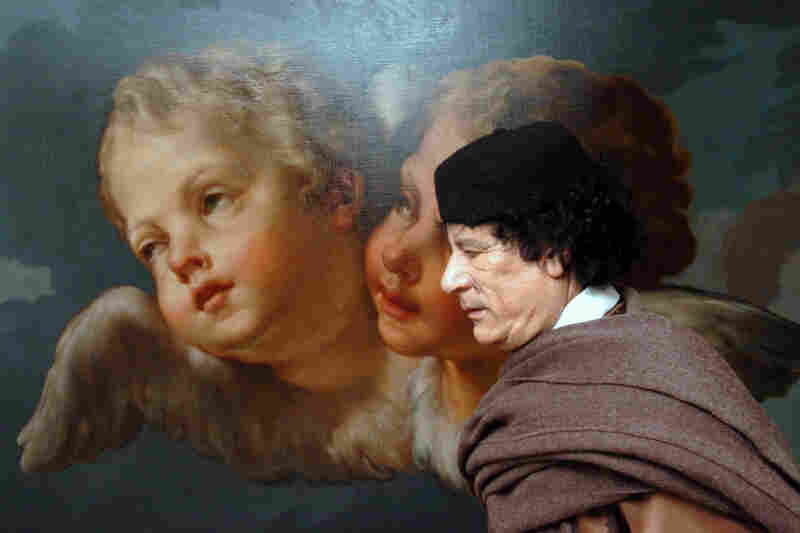 The trip marked another step in Gadhafi's quest to remake his image after years of international sanctions. In 2003, he agreed to give up his unconventional weapons program and to compensate relatives of Lockerbie bombing victims. 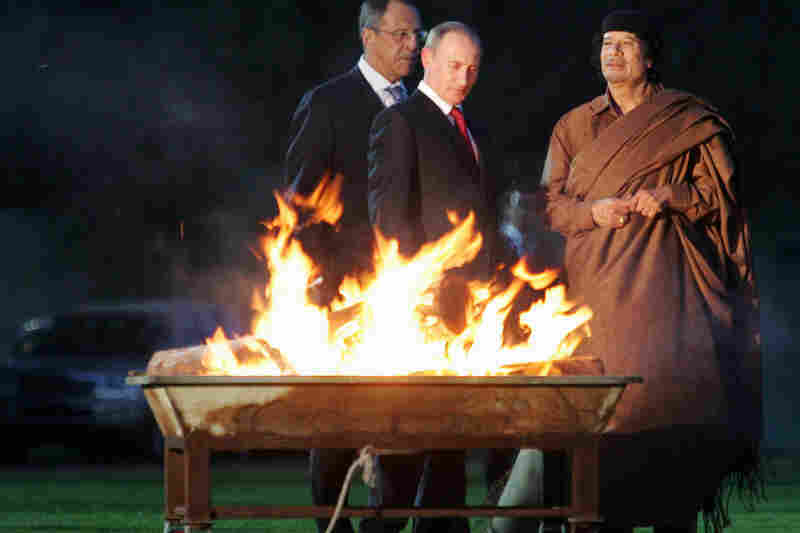 2008: Russia's Vladimir Putin (center) meets with Gadhafi (right) in Tripoli. Putin spent two days in Libya on an official visit to rebuild Russian-Libyan relations. 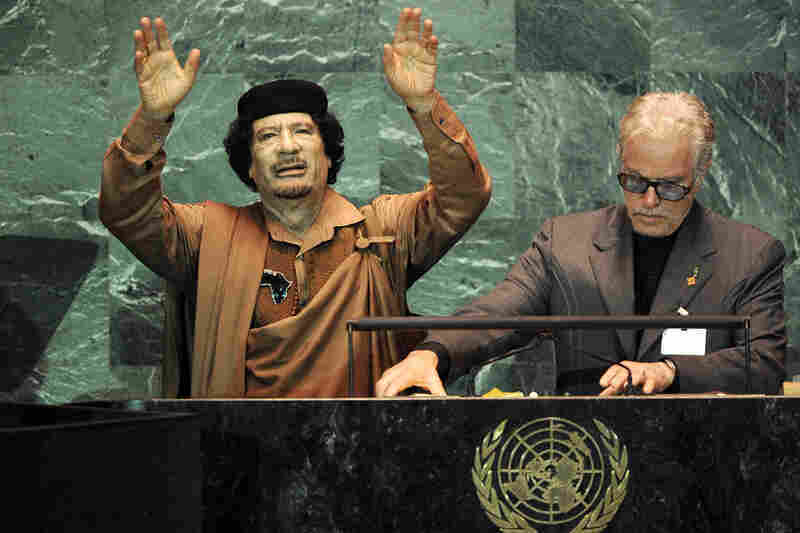 2009: Gadhafi finishes an hour-and-a-half speech during his first visit to the United Nations in New York. His speech came shortly after he welcomed back to Libya the man convicted in the Pam Am bombing, who'd been released from prison on medical grounds. 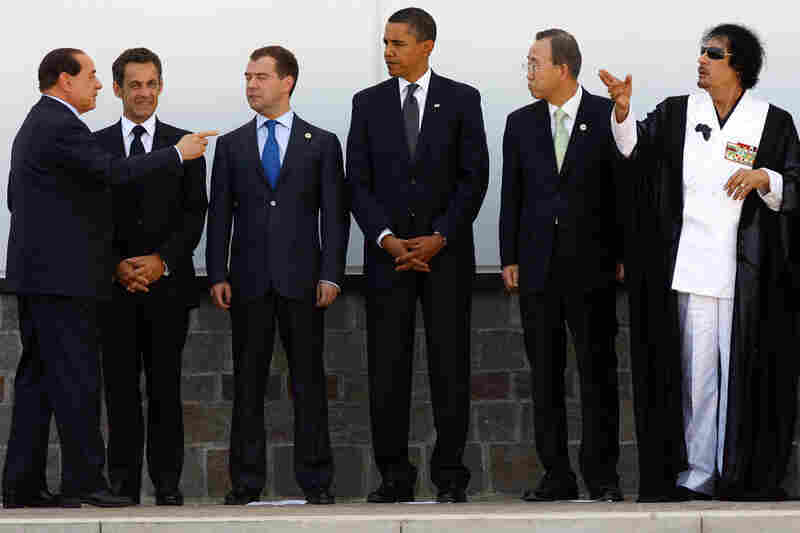 2009: Gadhafi poses with (from left) Italy's Silvio Berlusconi, France's Nicolas Sarkozy, Russia's Dmitry Medvedev, Barack Obama of the United States and United Nations Secretary-General Ban Ki-moon during a G8 summit in Italy. 2010: Gadhafi delivers a speech behind bulletproof glass in Benghazi, Libya, in 2010, calling for a jihad against Switzerland because of its ban on mosque minarets. 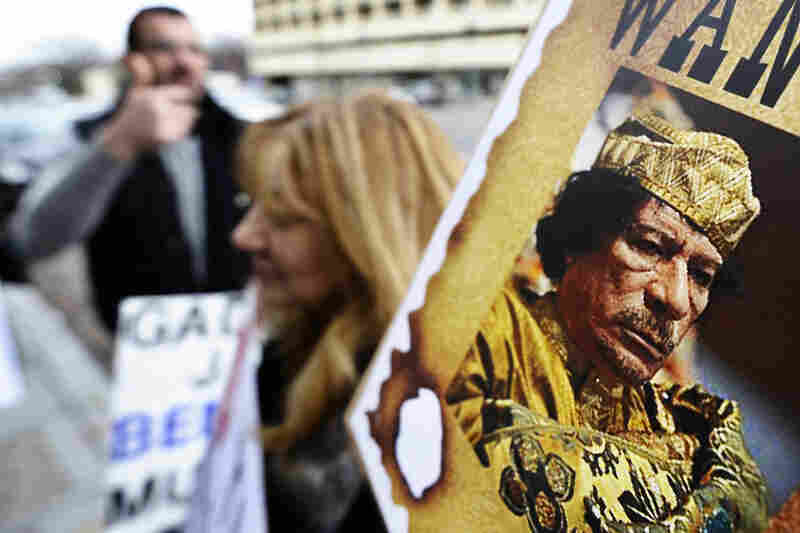 Feb. 24, 2011: Libyan nationals protest Gadhafi's regime in front of a building housing the Libyan embassy in Washington, D.C. Anti-government protests in Libya sparked a bloody crackdown by Gadhafi as opposition forces took control of the country's eastern half. March 2, 2011: Protected by bulletproof glass, Gadhafi leaves a Tripoli celebration of the 34th anniversary of establishing a "republic of the masses" in Libya. Weeks of anti-government protests have escalated into rebel forces clashing with pro-Gadhafi supporters for control of cities along the Libyan coast. Moammar Gadhafi ruled Libya with an iron fist for more than four decades. He was an unpredictable, often brutal leader with a grand vision of himself. In the end, he squandered his country's wealth and lost the support of his people. During his 42 years of rule, Gadhafi reinvented his image many times — from revolutionary to Arab nationalist, freedom fighter and self-styled leader of Africa. For about a decade he really saw himself as kind of the new seminal figure in Arab politics. I should say that image was not shared by anybody else. Gadhafi seized power in September 1969 after a nearly bloodless coup overthrowing then-King Idris. Dirk Vandewalle, an associate professor of government at Dartmouth and author of A History of Modern Libya, says that back then Gadhafi was a slim, handsome and austere young military officer who already had an outsized sense of himself. "Very clearly from the very beginning ... there was a sense that he really would be a young kind of Arab nationalist who would renew the sense of grandeur that the Arabs had had in the past," he says. Vandewalle says Gadhafi's hero at the time was Gamal Abdel Nasser, the president of neighboring Egypt. Both men shared an anti-Western sentiment and a vision of Arab renaissance. Nasser's death in 1970 gave Gadhafi an opportunity. "In a sense, Gadhafi took over this mantle of Arab nationalism, Arab socialism at the time," Vandewalle says. "For about a decade he really saw himself as kind of the new seminal figure in Arab politics. I should say that image was not shared by anybody else." 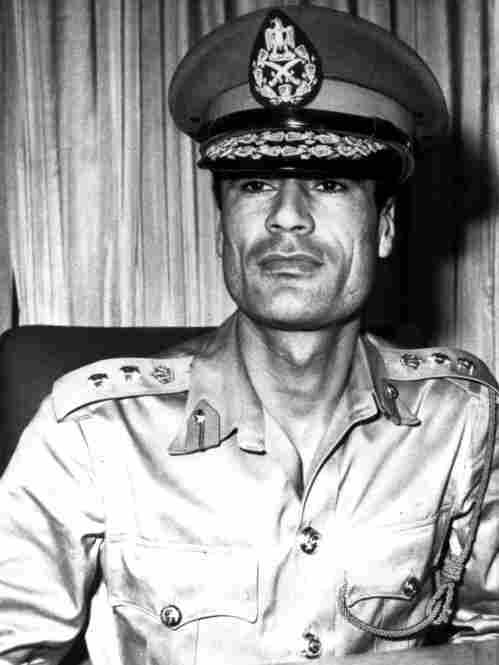 1969: Moammar Gadhafi, a 27-year-old military officer, stages a coup that deposes the ailing King Idris I, who is in Turkey receiving medical treatment. 1973-74: Gas prices in the U.S. spike as Gadhafi and other Arab leaders call for the cutoff of oil supplies to the U.S.
1977: Gadhafi declares a "government for the masses" in Libya. He describes it as direct, popular Arab democracy, and he eventually relinquishes all his official titles. 1986: President Ronald Reagan blames Gadhafi for the bombing of a Berlin nightclub popular with U.S. soldiers. Several days later, U.S. planes bomb Tripoli and Benghazi. Gadhafi's compound is hit, killing a 1-year-old who he said was his adopted daughter. 1988: Pan Am Flight 103, traveling from London to New York, explodes over Lockerbie, Scotland, killing all 259 people on the plane and 11 on the ground. Libya is linked to the bombing. 1999: After years of negotiations, Gadhafi agrees to extradite two Libyans accused of the Lockerbie bombing to the Netherlands. In exchange, U.N. sanctions are lifted. 2003: Gadhafi moves to re-establish relations with the West. He announces a halt to the country's weapons program and agrees to pay $2.7 billion in compensation to the families of the Lockerbie victims. 2006: U.S. and Libya agree to resume full diplomatic relations. 2011: In February, mass demonstrations break out in the eastern city of Benghazi, similar to other protests in the Arab world. 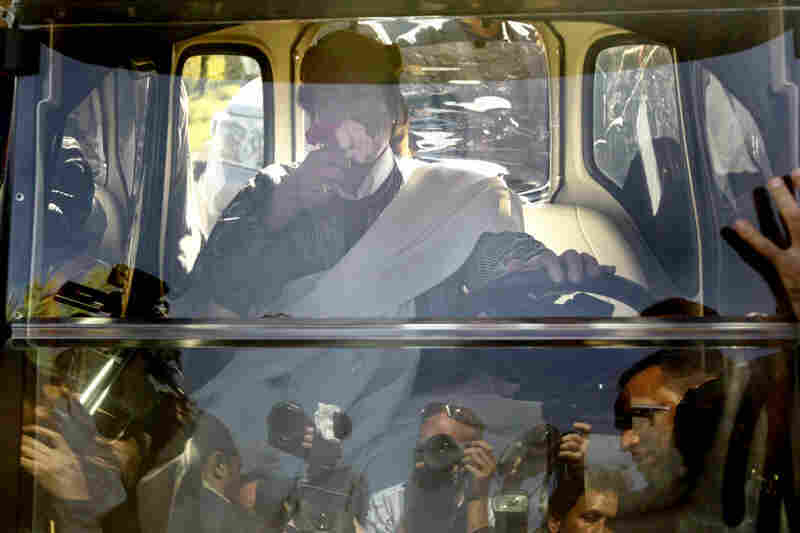 Gadhafi responds with a harsh crackdown. On Aug. 23, after fierce battles in and around Tripoli, Libyan rebels seize control of the Bab al-Aziziya compound in the capital. Gadhafi's immediate whereabouts are not known. 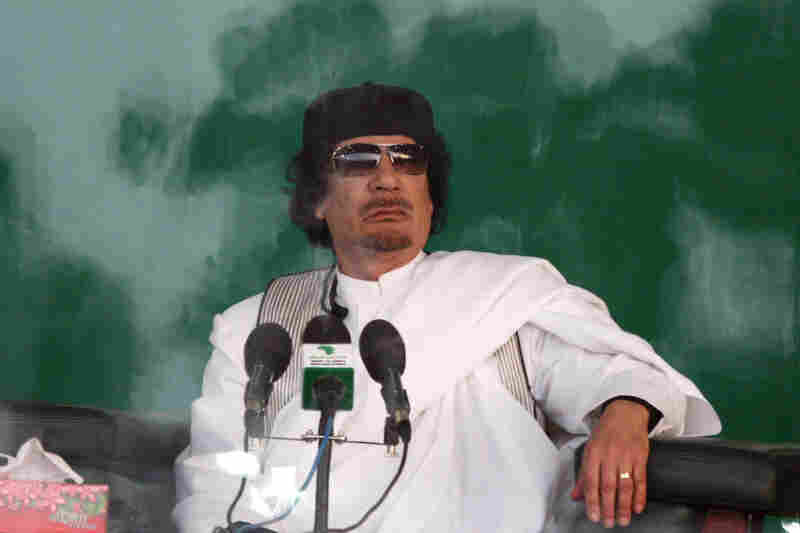 On Oct. 20, Libya's new leaders say Gadhafi was killed in his hometown of Sirte. Gadhafi came from humble beginnings; he was born in a tent in 1942 in the northeastern town of Sirte. Despite that, David Mack, former ambassador to the United Arab Emirates who first met Gadhafi after he seized power, says the leader received an unusually thorough education for a Libyan of that time — technical and military training, along with a masters degree in history. "He is very intelligent, I would say one of the highest-IQ people I've ever talked to. But there was always a feeling that he was not emotionally as stable," says Mack. That erratic behavior also was reflected in Gadhafi's style of government. 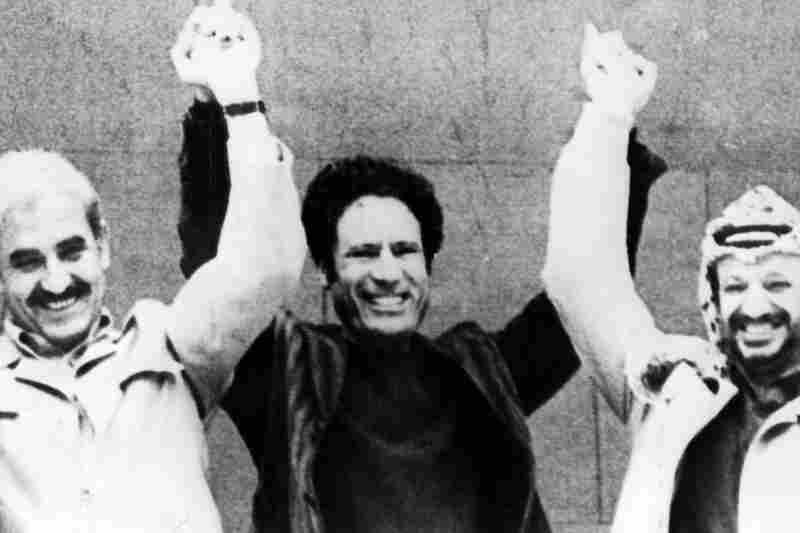 In the mid-1970s, Gadhafi published his manifesto, known as the "Green Book." It was a written account of Gadhafi's vision for Libya, which Mack says was quite jumbled. "I would describe this ... as being a mixture of utopian socialism, Arab nationalism, tribal and Islamic values and the idea of Islamic egalitarianism, along with anti-imperialism and a fair amount of xenophobia. And all these things kind of wrapped up in a strange mixture," says Mack. Libya's oil reserves supplied Gadhafi's government with an enormous cash flow. George Tremlett, the author of the book Gadaffi: The Desert Mystic, says much of that money went into the pockets of Gadhafi's inner circle. But Tremlett says the Libyan leader put some of the oil dollars to good use, such as constructing the world's largest drinking water pipeline, which brings millions of gallons of water from beneath the Sahara to Libyans along the Mediterranean coast. "They now have a very good water supply, and they now have crops where before they didn't have crops; they now have an agriculture where before they didn't have an agriculture," says Tremlett. But he says, for the most part, the people of Libya suffered rather than prospered. And over time, Gadhafi's regime became increasingly repressive. Political opposition was seen as treason, punishable by death. Gadhafi's harsh tactics went beyond Libya's borders. During the late 1970s and '80s, Gadhafi's government was linked to several terrorist attacks, and accused of supporting militant groups in Europe and elsewhere. In early April 1986, a bomb ripped through a Berlin disco frequented by U.S. service personnel. Two U.S. soldiers and a Turkish woman were killed. Shortly after, the U.S. struck back, launching a series of attacks on several Libyan installations. Nearly 100 people were killed in the U.S. attacks. Gadhafi said one of his children, an adopted daughter, was among them. Two years later, Gadhafi was alleged to be behind the bombing of PanAm Flight 103 over Lockerbie, Scotland, which killed 243 passengers and 16 crew members. He is very intelligent, I would say one of the highest-IQ people I've ever talked to. But there was always a feeling that he was not emotionally as stable. With the downing of the PanAm flight, Libya became an international pariah and remained so for nearly a decade. But then Gadhafi began to remake his image again. In 2003, Gadhafi agreed to make reparations for the families of victims of PanAm 103, and he agreed to renounce his unconventional weapons program. But when this year's uprisings spread from Tunisia and Egypt into Libya, Gadhafi tried to brutally crush the protesters. Several times, he appeared on television, defiantly refusing to step down. Vandewalle, the Dartmouth professor, says no matter how many times Gadhafi tried to remake himself over the years, he was always, at heart, a ruthless leader. "What we saw those last days was Gadhafi harking back to the kind of language he had used since he came to power — very defiant, being willing to fight to the last bullet," Vandewalle says. "In the end, the true Gadhafi was revealed again."